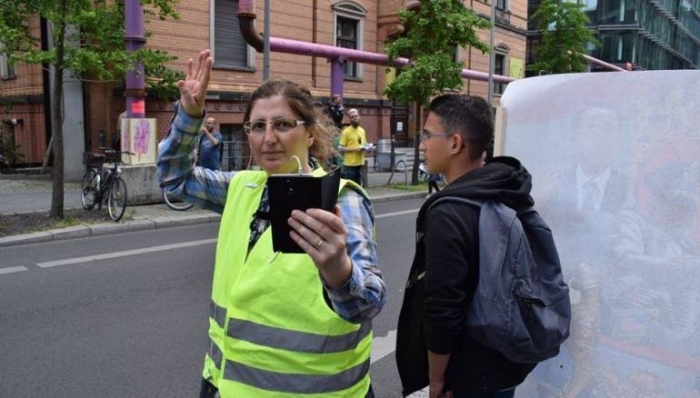 Maysoon Berikdar, a Syrian woman living in Germany, has angered many prominent and well known loyalists of the Syrian regime by berating them by phone for their support for the Assad government. « Free Wisam, » who is known in Berlin for riding her bicycle draped in the flag of the Syrian revolution, started her revolutionary activities in the first weeks of the Syrian revolution, engaging in debate with regime loyalists via the “Potluck” social media website. Many of the site’s users recorded Maysoon’s voice and broadcast her opinions on the pro-regime Addounia TV station, with presenter Rafik Lottof citing the recordings as proof of a global conspiracy against the Syrian government. A number of prominent figures, including renowned Syrian singer George Wassouf, have threatened to kill Berikdar in response to her phone calls, forcing her to seek protection from the German police. She has since started open confrontations with a number of regime loyalists including Talib Ibrahim and Bahjat Salman, the Syrian Ambassador to Jordan, who offered a bounty of five million Syrian pounds for the activist dead or alive. Born in 1966, Maysoon has been living in Germany for the past 22 years. She said that she will continue to support the revolution out of principle and she feels that she has a message in life. Maysoon said she is proud to have chosen the revolution’s side, and expressed her will to care for orphans and martyrs’ children once the revolution succeeds.